Patients undergoing laparoscopic procedures do experience postoperative pain, especially in the abdomen, back, and shoulder region. Intraperitoneal injections of a local anesthetic have been proposed to minimize postoperative pain after laparoscopic surgery. Therefore, this prospective, randomized, controlled, placebo study was conducted to compare the effectiveness of intraperitoneal lidocaine with that of intraperitoneal nalbuphine for postoperative analgesia after laparoscopic cholecystectomy (LC) surgery. Assiut University Hospitals, postoperative surgical world, Egypt. Eighty-one patients with ASA I or II undergoing LC were included in the study. They were classified randomly into three groups: group C, which comprised 27 patients who were given 50 ml normal saline intraperitoneally; group L, which included 27 patients who were given 200 mg lidocaine intraperitoneally in 50 ml normal saline; and group N, which included 27 patients given 10 mg nalbuphine intraperitoneally in 50 ml normal saline. Postoperative pain was recorded using the visual analogue scale for 24 h after LC. Postoperative analgesic consumption was also recorded. 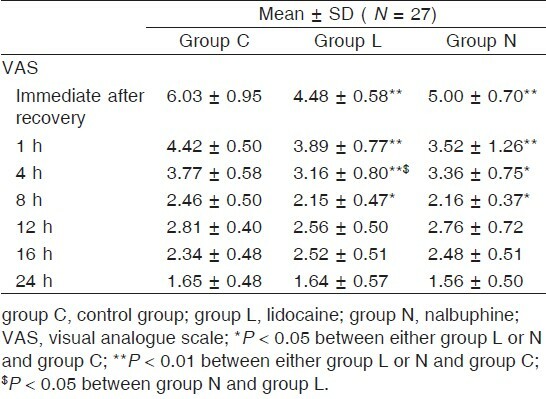 The mean visual analogue scale was significantly lower in both lidocaine and nalbuphine groups than in the control group within 24 h after surgery. The incidence of shoulder pain was 29.6% in the control group, 22.2% in the nalbuphine group, and 14.8% in the lidocaine group. The mean value of total analgesic consumption in the form of intravenous paracetamol was significantly lower in the lidocaine group (2.3 g ± 0.60) and nalbuphine group (2.5 g ± 0.63) when compared with control group C. There were no significant differences between the three groups as regards hemodynamics. Although both lidocaine and nalbuphine when used intraperitoneally produce postoperative analgesia, intraperitoneal lidocaine gives a better analgesic profile with fewer unwanted effects. Laparoscopic cholecystectomy is a minimally invasive technique and is associated with reduced surgical trauma, smaller and more cosmetic incision, and reduced blood loss, and is associated usually with fewer postoperative complications and decreased length of hospital stay. Hence, it is gradually replacing open surgery techniques when possible. However, patients undergoing laparoscopic procedures do experience postoperative pain, especially in the upper and lower abdomen, back, and shoulder region. Pain intensity usually peaks during the first few postoperative hours and usually declines over the following 2 or 3 days . Pain after laparoscopy results from the stretching of the intra-abdominal cavity , peritoneal inflammation, and phrenic nerve irritation caused by residual carbon dioxide in the peritoneal cavity ,. Intraperitoneal administration of local anesthetics ,,,,,,,, or opioids ,,,, was carried out to induce postoperative analgesia and decrease analgesic requirements. Therefore, this randomized controlled study was conducted to compare the effectiveness of intraperitoneal lidocaine versus nalbuphine for postoperative pain relief after laparoscopic cholecystectomy. This study was conducted in Assuit University Hospitals from February 2010 to May 2011 after approval from the local ethics committee and after obtaining informed consent from each patient. Eighty-one patients with ASA I aged 19-50 years and undergoing laparoscopic cholecystectomy were included in the study. They were classified randomly into three groups: group C, which comprised 27 patients who were given 50 ml normal saline intraperitoneally; group L, which included 27 patients who were given 200 mg intraperitoneal lidocaine in 50 ml normal saline; and group N, which included 27 patients given 10 mg nalbuphine in 50 ml normal saline intraperitoneally. All intraperitoneal drugs were instilled immediately after laparoscopic removal of the gall bladder and after performing complete washing of peritoneal cavity and aspiration of the solution used for irrigation and before wound closure. All drugs used in the study were packed in white plastic syringes labeled with numbers that coded its content. Packing, labeling, and coding of these containers were performed by the first author. Patients with chronic respiratory disease, neurological disease, impaired cardiac functions or serious disrrhythmias, advanced renal or hepatic diseases, or with previous abdominal surgery were excluded from research. Before starting anesthesia, the visual 100 mm visual analogue score (VAS) (where 0 mm indicated total dissatisfaction and 100 mm indicated total satisfaction) was explained to every patient. For all included patients general anesthesia was induced by intravenous thiopentone sodium of 3-5 mg/kg, and all patients were given intravenous 100 μg fentanyl; endotracheal intubation was facilitated using intravenous atracurium besylate 0.5 mg/kg. Maintenance of anesthesia was performed by inhalational isoflurane 0.5-1.5% in 100% oxygen, and a state of muscle relaxation was maintained by infusion of 0.5 mg/kg/h atracurium besylate with controlled mode of mechanical ventilation and adjusted parameters to keep end-tidal CO 2 at normal values. All patients were continuously monitored by both lead II and V5 ECG, repeated noninvasive mean arterial blood pressure (MAP) measurement every 5 min, and continuous end-tidal CO 2 and oxygen saturation (SpO 2 ) by pulse oximetry. Intravenous fluid therapy was given according to the calculated formula (according to the 4/2/1 rule per fasting hours for maintenance of fluid requirements+4 ml/kg/h for third space loss+replacement of surgical bleeding if present). Recovery was performed by discontinuation of general anesthetics and reversal of neuromuscular blockers, and extubation was performed after ensuring adequate motor power and no analgesics were given to patients before recovery. After recovery, patients were monitored for heart rate (HR) and MAP measurement every 15 min during the first hour from recovery and then every 4 h for 24 h. Arterial blood gas was evaluated immediately after recovery and then 12 and 24 h after surgery. 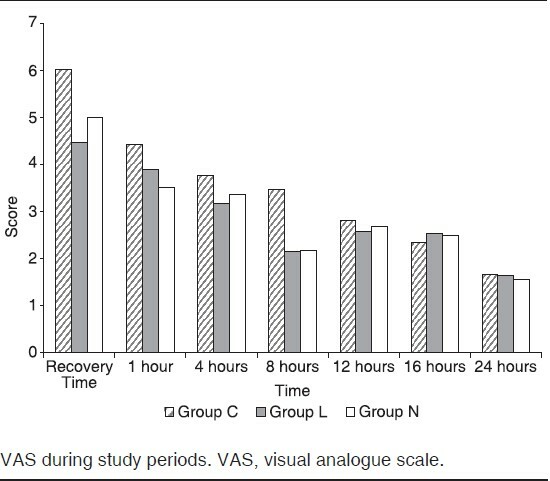 Patients were assessed for severity of pain using VAS immediately after recovery, after 1 h, and then every 4 h from recovery in the first 24 h. If VAS was 3 or more, intravenous infusion of 1 g paracetamol was given. Any complications such as respiratory depression, nausea, vomiting and/or itching were also recorded. Also, the total dose of consumed postoperative analgesics was reported. where n is the required sample size; t the confidence level at 95% (standard value of 1.96); p the percentage picking a choice, and m the margin of error at 5% (standard value of 0.05). The data were collected and presented as mean ± SD, proportion, or n (%) and entered on Microsoft excel to be analyzed using the statistical package for social science (version 15; SPSS Inc., Chicago, Illinois, USA). Analysis of variance and the χ2 -test were used to check that the study groups were matched in terms of demographic data. The one-way analysis of variance test followed by the post-hoc test was used to analyze VAS between groups. Significance level was considered if the P value was less than 0.05. The sample size needed for the duration of the study (15 months) was 81 patients (ASA physical status I); they were planned for laparoscopic cholecystectomy. Demographic data of patients and duration of surgery showed no significant difference between the three groups [Table 1]. Mean values of HR were significantly lower in group L and group N than in group C immediately after recovery from anesthesia (P < 0.001) and after 15, 30, 45 min, 8, and 16 h from recovery (P < 0.05). Other time points of study did not show any statistical difference between the groups. MAP also was significantly lower in group L and group N when compared with group C immediately after recovery from anesthesia (P < 0.001), 15 min later (P < 0.01), and after 30 min from recovery (P < 0.05). Other time points of study did not show any statistical difference between the groups [Table 2]. Arterial blood gas parameters including pH, PaCO2, PaO 2 , and HCO 3 were comparable between the groups and showed a nonsignificant difference. As regards the severity of pain, as determined by VAS [Table 3] and [Figure 1], it was significantly lower in group L and group N as compared with group C immediately after recovery and after 1 h (P < 0.01), 4, and 8 h (P < 0.05) for group N and after 4 h (P < 0.01) and 8 h (P < 0.05) for group L, whereas other points of measurement showed no statistical difference between the groups. Comparison between group L and group N did not show any statistical difference between the groups at any time points of study, except at 4 h from recovery, when a significantly lower VAS was observed in group L than in group N (P < 0.05). The mean value of total analgesic consumption in the form of intravenous paracetamol was significantly lower in group L (2.3 ± 0.60 g) and group N (2.5 ± 0.63 g) when compared with group C (P < 0.05). Although the total dose of intravenous paracetamol consumed in group L was lower than that in group N, this decrease was not statistically different. Eight patients from group C (29.6%) developed shoulder pain within the first 24 h, which required medical intervention and was relieved by treatment with intramuscular 30 mg ketorolac once, whereas in group L only four patients (14.8%) and in group N six patients (22.2%) developed shoulder pain, which was relieved also by a single dose of intramuscular 30 mg ketorolac. 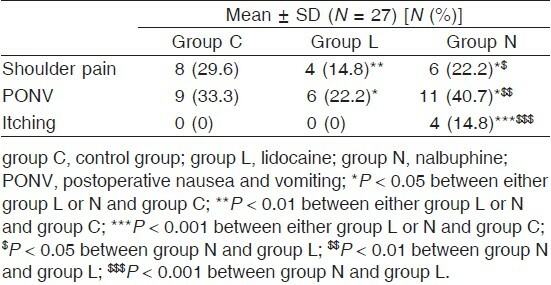 Incidence of postoperative nausea and vomiting (PONV) was greater in group N and group C than in group L, as nine patients from group C (33.3%) and 11 patients from group N (40.7%) developed PONV in the first 24 h, whereas in group L only six patients (22.2%) complained of PONV. The condition of most patients who developed PONV in the three groups improved after using 20 mg intravenous metoclopromide once. Only one patient from group N developed repeated attacks of PONV and did not improve with 40 mg intravenous metoclopromide only and required 4 mg intravenous ondansetron once. Four patients from group N developed postoperative itching, which was relieved completely with 25 mg pheniramine salicylate, whereas no one from group C or group L developed any attack of postoperative itching. No other postoperative complication was recorded in any group [Table 4]. In this research we tried to determine whether lidocaine or nalbuphine when used through an intraperitoneal route could improve postoperative analgesia and decrease postoperative requirement of analgesics. We found that pain intensity was lower as determined by lower VAS in patients who received intraperitoneal nalbuphine or lidocaine compared with those who received intraperitoneal saline during the first 8 h after recovery, whereas no difference in VAS could be detected between any of the groups later during the first 24 h. The total dose of postoperative analgesics used was markedly reduced in patients given intraperitoneal lidocaine and nalbuphine. Also, we detected a significant decrease in HR during the first 45 min and after 8 and 16 h from recovery. MAP in the first 30 min after recovery was significantly lower in patients who received intraperitoneal lidocaine and nalbuphine than in those who were given intraperitoneal saline; this decrease may be partly or completely due to analgesia produced by lidocaine and nalbuphine. Our results matched with those of Hernαndez-Palazón et al. , who studied the analgesic effect of the intraperitoneal administration of bupivacaine and morphine, and with those of Pasqualucci et al. , who used a local anesthetic (bupivacaine) intraperitoneally as an analgesic for laparoscopic cholecystectomy. They found that pain intensity and analgesic requirements were significantly less in the group receiving bupivacaine after surgery compared with placebo. Several studies ,,,, used intraperitoneal lidocaine to control postlaparoscopic pain and most of these studies demonstrated significant improvement in postoperative pain and lower consumption of postoperative analgesics during the first 24 h. Also, our results are similar to the results of Khan et al. who used both bupivacaine and lidocaine intraperitoneally during laparoscopic cholecystectomy for postoperative analgesia and they concluded that bupivacaine and lignocaine (lidocaine) are both safe and equally effective at decreasing postoperative pain after laparoscopic cholecystectomy. Also, some studies ,, evaluated intraperitoneal instillation of 400 mg lidocaine versus intraperitoneal saline in variable laparoscopic maneuvers such as diagnostic and operative gynecological laparoscopy, sterilization, fundoplication, appendectomy, hernia repair, and cholecystectomy and they reported significantly reduced pain scores with VAS reductions up to 26 mm early and up to 24 h postoperatively and significantly reduced supplemental analgesic consumption by ∼50%. Some studies used opioids intraperitoneally for postoperative analgesia, including morphine , fentanyl , or tramadol ,,. The results of these studies were in agreement with our results, as they recorded good analgesic action of these drugs when used intraperitoneally to control postoperative pain, but we did not find any previous study in which intraperitoneal nalbuphine was administered for postoperative pain relief. However, Ali et al. reported that intraperitoneal administration of a local anesthetic solution into the pelvic cavity did not confer appreciable analgesia in patients undergoing abdominal hysterectomy. This could be explained by greater pain sensation due to more tissue trauma caused by open surgery and longer duration of operative maneuver compared with laparoscopy, which may not be blocked effectively by intraperitoneal local anesthetics. Contrary to our findings, Schulte-Steinberg et al. found that intraperitoneal morphine did not produce significant analgesia after laparoscopic cholecystectomy. We found that incidence of shoulder pain was lower in patients given intraperitoneal nalbuphine or lidocaine compared with the control group. In agreement with our results Narchi et al. , Kim et al. and Kang et al. , reported that intraperitoneal lidocaine was more effective in reducing postoperative shoulder pain compared with patients given nothing or those given intraperitoneal saline. However, Lepner et al. and Gupta et al. found no significant differences in the mean shoulder pain scores between patients given intraperitoneal lidocaine and those who were not given local anesthetics. Most of the studies ,, using intraperitoneal opioids found no significant difference between patients given intraperitoneal opioids and the controls in terms of shoulder pain, which is not in agreement with our results, but this may be because none of these studies used intraperitoneal nalbuphine. The incidence of PONV was greater in patients given intraperitoneal nalbuphine or saline than in patients given intraperitoneal lidocaine. In agreement with this result, Visalyaputra et al. found greater incidence of vomiting in patients given intraperitoneal morphine than in others; however, most of other studies ,,,, did not find a statistical difference between patients given either intraperitoneal lidocaine or opioids and the control patients with respect to the incidence of PONV. Intraperitoneal instillation of lidocaine or nalbuphine is an easy, cheap, and noninvasive method that provides good analgesia in the postoperative period after laparoscopic cholecystectomy compared with placebo. However, lidocaine was found to have a better analgesic profile with fewer unwanted effects compared with nalbuphine. 1. R Gupta, Bogra J, Kothari N, Kohli M. Postoperative analgesia with intraperitoneal fentanyl and bupivacaine: a randomized control trial. Can J Med 2010; 1:1-11. 2. Joris J, Thiry E, Paris P, Weerts J, Lamy M. Pain after laparoscopic cholecystectomy: characteristics and effect of intraperitoneal bupivacaine. Anesth Analg 1995; 81:379-384. 3. Schoeffler P, Diemunsch P, Fourgeaud L. Outpatient Laparoscopy. Cah Anesthesiol 1993; 41:385-391. 4. Jakson SA, Laurence AS, Hill JC. Does post-laparoscopy pain relate to residual carbon dioxide? Anaesthesia 1996; 8:441-445. 5. Pasqualucci A, de Angelis V, Contardo R, Colò F, Terrosu G, Donini A, et al. Preemptive analgesia: intraperitoneal local anesthetic in laparoscopic cholecystectomy. A randomized, double-blind, placebo-controlled study. Anesthesiology 1996; 1:11-20. 6. Elhakim M, Elkott M, Ali NM, Tahoun HM.Intraperitoneal lidocaine for postoperative pain after laparoscopy. Acta Anaesthesiol Scand 2000; 3:280-284. 7. Palmes D, Röttgermann S, Classen C, Haier J, Horstmann R. Randomized clinical trial of the influence of intraperitoneal local anaesthesia on pain afterlaparoscopic surgery. Br J Surg 2007; 7:824-832. 8. Khan MR, Raza R, Zafar SN, Shamim F, Raza SA, Pal KM, et al. Intraperitoneal lignocaine (lidocaine) versus bupivacaine after laparoscopic cholecystectomy: results of a randomized controlled trial. J Surg Res 2012; 2:662-669. 9. Ahmed BH, Ahmed A, Tan D, Awad ZT, Al-Aali AY, Kilkenny J 3rd, et al. Post-laparoscopic cholecystectomy pain: effects of intraperitoneal local anesthetics on paincontrol - a randomized prospective double-blinded placebo-controlled trial. Am Surg 2008; 3:201-209. 10. Narchi P, Benhamou D, Fernandez H. Intraperitoneal local anesthetic for shoulder pain after day-case laparoscopy. Lancet 1991; 338:1569-1570. 11. Helvacioglu A, Weis R. Operative laparoscopy and postoperative pain relief. Fertil Steril 1992; 57:548-552. 12. Visalyaputra S, Lertakyamanee J, Pethpaisit N, Somprakit P, Parakkamodom S, Suwanapeum P. Intraperitoneal lidocaine decreases intraoperative pain during postpartum tubal ligation. Anesth Analg 1999; 88:1077-1080. 13. Ali PB, Cotton BR, Williamson KM, Smith G. Intraperitoneal bupivacaine or lidocaine does not provide analgesia after total abdominal hysterectomy. Br J Anaesth 1998; 80:245-247. 14. Hernández-Palazón J, Tortosa JA, Nuño de la Rosa V, Giménez-Viudes J, Ramírez G, Robles R. Intraperitoneal application of bupivacaine plus morphine for pain relief after laparoscopic cholecystectomy. Eur J Anaesthesiol 2003; 20:891-896. 15. Akinci SB, Ayhan B, Aycan IO, Tirnaksiz B, Basgul E, Abbasoglu O, et al. The postoperative analgesic efficacy of intraperitoneal tramadol compared to normal saline or intravenous tramadol in laparoscopic cholecystectomy. 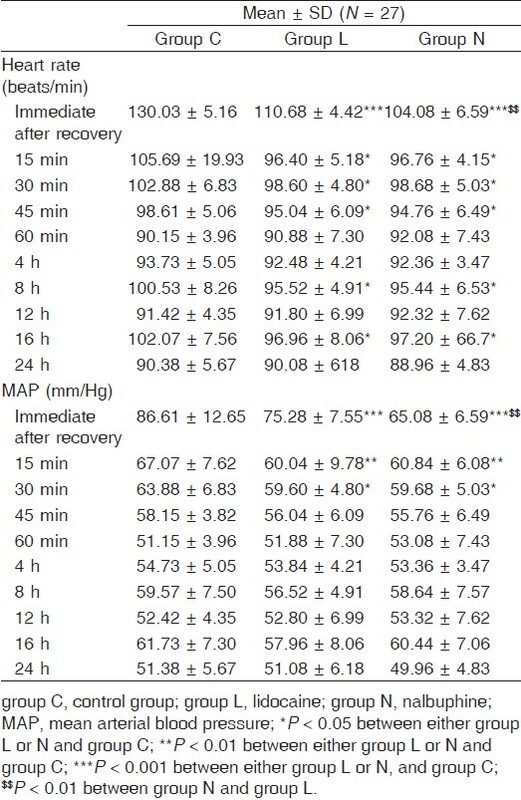 Eur J Anaesthesiol 2008; 25:375-381. 16. Memis D, Turan A, Karamanlioglu B. Intraperitoneal tramadol and buvacaine in total abdominal hysterectomy. Eur J Anaesthesiol 2005; 22:804-805. 17. B Karsli, N Kayacan, G Zorlu, G Arici, M Erman. The effects of intraperitoneal tramadol, tenoxicam and bupivacaine on pain relief after laparoscopic gynecological procedures. Pain Clin 2003; 15:281-287. 18. Schulte-Steinberg H, Weninger E, Jokisch D, Hofstetter B, Misera A, Lange V, Stein C. Intraperitoneal versus interpleural morphine or bupivacaine for pain after laparoscopic cholecystectomy. Anesthesiology 1995; 82:634-640. 19. Kim TH, Kang H, Hong JH, Park JS, Baek CW, Kim JY, et al. Intraperitoneal and intravenous lidocaine for effective pain relief after laparoscopic appendectomy: a prospective, randomized, double-blind, placebo-controlled. Surg Endosc 2011; 25:3183-3190. 20. Lepner U, Goroshina J, Samarütel J. Postoperative pain relief after laparoscopic cholecystectomy: a randomised prospective double-blind clinical trial. Scand J Surg 2003; 92:121-124. 21. Kang WJ, Kim SH, Lee SM. Effects of intraperitoneal lidocaine on abdominal and shoulder pain after a laparoscopic cholecystectomy. Korean J Anesthesiol 2002; 42:198-204.